Houbigant Quelques Fleurs Royale, an exquisite fragrance inspired by aristocracy. 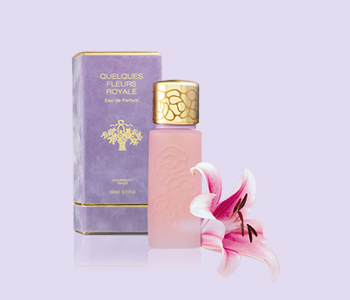 A celebration of the essence produced for Princess Adelaide d'Orleans 175 years ago, developed taking inspiration from key notes in the legendary Quelque Fleurs bouquet. Following in the Houbigant heritage, this scent is a genuine multi-floral bouquet that is modernised for today's discerning women by adding a twist of innovative and vibrant originality. Precious woods are blended with exotic flowers, and then enveloped in the fizzy freshness of citrus fruits.